Umbilical hernias commonly often occur directly after birth during infancy and are the result of the abdominal wall around the navel not developing completely. This gap in the abdominal wall allows intestines and parts of organs from inside the abdomen to enter the hernial sac. Umbilical hernias are common in babies. They usually resolve without problems and do not require any treatment. During the first 2 years of life, they often spontaneously resolve as the increased abdominal muscle mass closes the gap. In adults, most umbilical hernias are acquired. They can be caused by increased pressure in the abdominal cavity. This may occur for a number of reasons - being overweight, for example, having ascites or being pregnant. Constant straining due to stubborn bowels / constipation can also lead to an umbilical hernia. Umbilical hernias often cause no symptoms, and they are often diagnosed as an incidental finding. Depending on the size of the hernial orifice and the swelling of the hernia, the symptoms they can trigger can vary considerably. If the hernia is filled with abdominal fluid (ascites), there can be marked swelling, although this does not otherwise produce any other symptoms. If, however, parts of organs from the abdominal cavity become trapped in it, such as a loop of bowel, this can impede intestinal transit, leading to an intestinal blockage (ileus) that requires emergency surgical treatment. In most cases, umbilical hernias cause only very non-specific symptoms, such as occasional dragging or a stitch-like pain in the area of the navel. An umbilical hernia can usually be diagnosed simply by clinical examination, i.e. following inspection and palpation of the hernial orifice. We subsequently carry out an ultrasound examination of the anterior abdominal wall. This not only provides an accurate picture of the size of the hernial orifice and what the hernial swelling contains, but it also allows us to rule out any other defects in the midline area (known as epigastric hernias). Another advantage of ultrasound is that it allows us to exclude rectus diastasis. Essentially, just like the treatment of inguinal hernias, a distinction is made between repair methods with and without mesh and using open and laparoscopic approaches. The decision regarding the use of a mesh is made based on size of the hernial orifice, whether or not the patient is overweight and other patient-specific risk factors. Where the fascia defect is small (< 1.5 cm) and there are no other risk factors, a suturing approach still remains a reliable surgical method even today. In this case, once the edges of the fascia are exposed, careful continuous suturing is performed using non-absorbable stitches. For larger fascia defects (> 1.5 cm) or for patients with a relevant risk profile, additional mesh reinforcement (= mesh augmentation) should be used. This can be performed as an onlay, inlay, sublay, pre-peritoneal or from inside as an open or laparoscopic IPOM (Intra-Peritoneal Onlay Mesh-plasty). If mesh augmentation of the abdominal wall is indicated, we generally prefer to position the mesh outside of the abdominal cavity (extra-peritoneal). This prevents any complications associated with the mesh, such as adhesions between the mesh prosthesis and the abdominal organs. We believe the pre-peritoneal space, which lies in the layer between the peritoneum and the fascia of the abdominal wall, to be the "ideal" location. In most cases, simple blunt pushing will create an adequately sized mesh bed, allowing the mesh to extend by at least 2-3 cm beyond the fascia defect. The mesh is then placed between the peritoneum, which continues to act as a natural protective barrier for the intestines, and the posterior abdominal wall fascia, and is only secured in position in places with single button sutures using absorbable suture material. On top of this, the fascia defect is closed with continuous non-absorbable sutures (e.g. Prolene 2-0). By using large-pored, reduced-surface mesh prostheses, the amount of foreign body material implanted and therefore the body's reaction to foreign bodies can be reduced as much as possible. 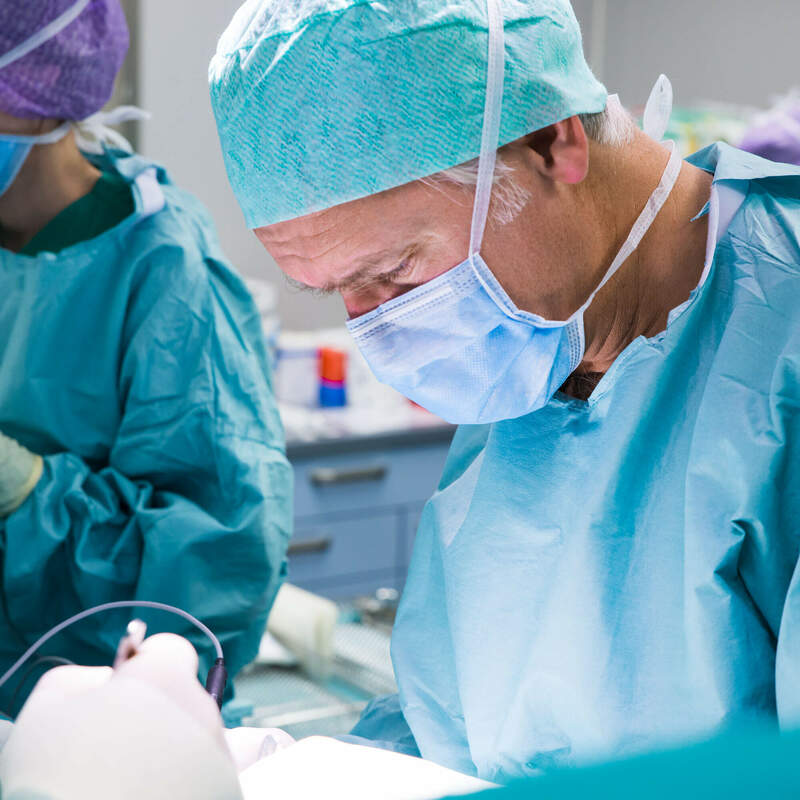 Umbilical hernias are usually repaired under local anaesthetic. At the patient's request, we can also use analgesia plus sedation, which induces a sleepy state. This type of anaesthesia carries far fewer risks and patients tolerate it better. Regardless of the type of operation performed, normal strain on the abdominal wall is possible and allowed directly after the operation until the pain limit is reached. Recent studies have confirmed that an unwanted cough or sneeze can put much more strain on the surgical site than any form of muscle-supported physical exercise. Adequate pain relief is essential during the first 3-5 days after surgery in order avoid unnecessary shielding and possible constipation. The decision regarding the repair method used is made on an individual basis for each patient, taking account of their anatomy and their risk profile. The aim is to reconstruct the abdominal wall anatomy and restore function using a synthetic mesh to reinforce it (mesh augmentation). To avoid possible mesh-related foreign body reactions (e.g. adhesions) inside the abdominal cavity, care is taken to place the mesh extra-peritoneally, i.e. outside the abdominal cavity. We would be delighted to provide you with more detailed information about all of the treatment options or surgical options available. Give us a call or arrange an appointment for a consultation by e-mail. Mon and Wed 9 a.m. to 6 p.m.
Tue, Thu, Fri 9 a.m. to 4 p.m.